I won't be able to participate in this one either, because the book isn't easily available to me. Maybe next time. I read the first chapter of this while my daughter was looking around in the bookstore and it sounds like it's going to be great! Like Marg, I won't participate either. It will cost me too much money for so few pages. And children's lit isn't on my wishlist. i'm not going to get to Cold Comfort Farm ... just too much going on this month, i guess. 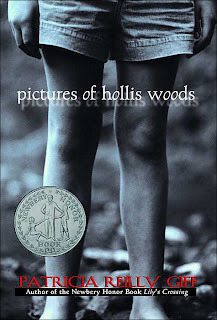 but i've picked up Pictures of Hollis Woods from the library, and i'm looking forward to reading and discussing it. I love Pictures of Hollis Woods. It is the best book ever!!!!!!!!!!!!!!!!! !